"This book is a marvel! Packed with truly vital information both for the newly qualified and for the experienced therapist in private practice. The frequent vignettes and discussions are a delight, bringing a range of complex and challenging technical issues to life. This book gives an engaging and practical insight into what is usually the very private world of private practice." "I wish this marvelous book had come my way earlier. It's an esssential read for any therapeutic practitioner, but particularly for those in their first years in the profession or who are still in training. Pauline Hodson has applied her extensive experience and 'knowhow' to create this valuable tool kit that covers all the practicalities, and much more, of running a private practice or clinic. 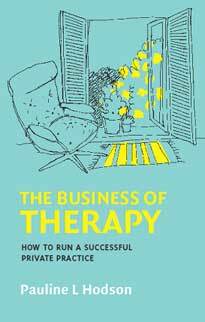 Written with great heart but also in a boundaried psychodynamic style, The Business of Therapy is practical, wise and down to earth without ever being prescriptive. It's a pleasure to recommend it." "A highly experienced and deeply wise practitioner of psychotherapy, Pauline Hodson serves as the most trustworthy of guides and mentors, providing mental health professionals with a counucopia of illuminating advice about the crucial minutiae of our work. Written with admirable consision and with the page-turning delights of a fine novel, htis book will be a joy seasoned colleagues, and a lifepsaver for students and for those newly qualified. The Business of Therapy: How to Succeed in Private Practice leaves all the others int he dust." " The date is Thursday, 7th July, 2005. The time is early morning. "Mrs. X., a psychotherapist, finds herself waiting in her consulting room. Her patient is quite late in arriving. Eventually, the young woman bursts in, explaining that someone had just detonated a bomb on the London Underground. The patient named a tube particular tube station, and at that moment, the psychotherapist’s heart sank, as she realised instantly that her grown son uses that same tube station every single morning en route to his work. What on earth should the psychotherapist do in the middle of both a private psychotherapy session and, simultaneously, a terrifying national emergency? Should she continue with the session, or should she excuse herself and run to telephone her son? "Mrs. Y., also a psychotherapist, could hear that an intruder had broken through the gate of her home with a crowbar, whilst mid-session with a patient. What should she do? Ought she to persevere with the session and perhaps endanger both herself and her patient, or should she ring the police immediately? "Both of these chilling vignettes, each completely true, can be found in the pages of Pauline Hodson’s new book, The Business of Therapy: How to Succeed in Private Practice, probably the best of the many books yet written on this topic. Fortunately, not all of the stories reported in this book involve terrorism and robbery. Often, Mrs. Hodson helps the reader to think about the more ordinary, more simple dilemmas of everyday practice, offering her thoughts on what one does if a patient does not pay a bill, or how one should manage extra-therapeutic contact outside the consulting room, as might occur when one bumps into a patient in a shop. And herein lies one of the many strengths of this beautifully written work, for within this elegant handbook, Pauline Hodson steers her readers on a journey through both the expected and the unexpected events of daily psychotherapeutic practice, through the mundane and the extraordinary, and through what she calls the 'feast' or the 'famine'. "In spite of the relatively small number of pages in this book, Hodson has written with such concision that she manages to cover an enormous array of topics, such as: furnishing the consulting, handling noisy neighbours, maintaining a website, the ethics of charging for missed sessions, professional wills, income tax information for psychotherapists, data protection, and so much more. At first glance, most experienced psychotherapists and psychoanalysts might imagine that this book would be of value only to students or to newly qualified clinicians; but, in fact, Hodson’s text has much to teach even the most seasoned of practitioners. Not only does she consider virtually every “management” issue that one might imagine, but she brings an artistic quality to her discussion of the consulting room, and even offers thoughts on what one should or should not have in the bathroom, and on how one should manage one’s inevitably untidy stack of paperwork!
" The more I read of this charming and modestly written book, the more I became absorbed, and began to rethink so many aspects of my practice. Have I placed the bin or the box of tissues in the best location? Should I think about a different message on the answering machine? And so forth.
" To her great credit, although Mrs. Hodson shares her own views on these minutiae of daily work with great generosity, she never preaches. Furthermore, unlike authors of previous books on the setting up and management of a psychotherapy practice, Hodson has interviewed a large number of colleagues, and she offers their viewpoints, as well, on a host of topics such as moving consulting rooms, taking a sabbatical, managing illness, and preparing for retirement and death.
" Graciously introduced by Dr. Susie Orbach who has described this book as “a gift to our field”, Pauline Hodson not only allows us to consider and reconsider all of the underexplored aspects of private psychotherapeutic work, but, she also conveys a great deal about her personal philosophy of being a professional. Hodson communicates a real sense of pleasure in doing the work, in being able to reflect upon the work, and in surviving the more challenging aspects of the work. One senses Hodson to be a colleague with a warm heart and a fine mind – a powerful combination. I recommend this book, without reservation, as a deeply engrossing contribution to our literature that will be of value to neophytes and to near-retirees alike.
" If you want to know what happened to Mrs. X., the psychotherapist whose son had travelled on the tube on 7/7, or if you want to know what Mrs. Y. did when an intruder broke through her gate mid-session, you will have to buy the book."